I’m still working on my ancient pink UFO which is getting a total makeover, and I’m having so much fun with it! There is no formal pattern — it’s just 12 salvaged sampler blocks, and I’m making it up as I go along. The cornerstones and sashings are finished. And now I’m making 9-patch blocks for the borders. 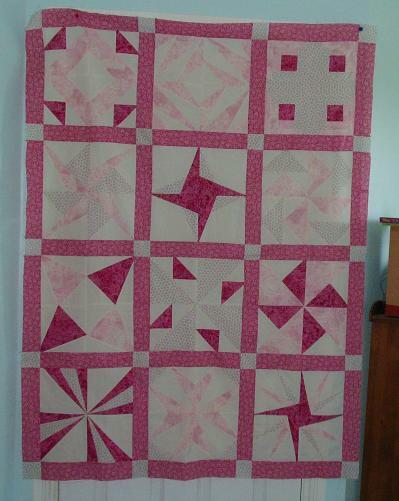 To see what other quilters have on their Design Walls today, please visit Judy’s blog, Patchwork Times. That is so pretty! (and I’m not usually a huge fan of pink). I really like the different blocks which gives it loads of interest for the eye. It will be lovely – how big are your 9 patches? I like the way some of the blocks seem to jump out at you. For some reason I have developed a liking for pink. Usually I like the darker colors. Maybe my color palette is changing with spring. You are going to have a beautiful quilt. Can’t wait to see the finished product. It is going to be a prety quilt and soon a finished UFO! on March 29, 2010 at 11:52 am | Reply Kathie L.
very pretty, I think of cotton candy when I see it. I like the changes you made. Very pretty. lovely quilt and love the little 9-patch blocks! I can’t wait to see this with the borders on. It’s nice that you are having fun with it. The piece in my stashbusting report is an art piece, about 9 inches by 12 inches. It was a challenge to use tulle in a quilt for my Art Quilt Group. Sorry to answer this way but my blog host hides everyone’s email addresses. It makes me crazy! I like to see people actually making quilts from the sampler blocks they make. And your quilt is coming along nicely. 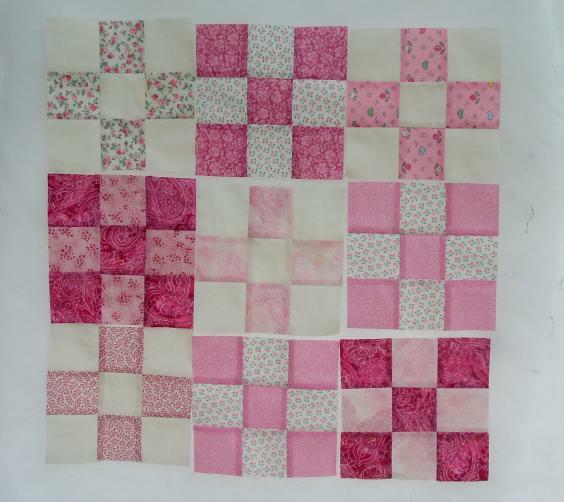 What a great way to make the most of “spare” sampler blocks – it looks terrific!